Wind the tape forward a little over six months and you see us returning from the annual pinnacle of tournament paintball, the World Cup in Orlando. It was now the time to figure out how to actually put our 40+ hours of material to work (you can probably imagine what it takes to merely go through such a mountain of video, let alone 1) choose the bits we felt would best support our argument, and 2) cut and edit them to a videography work). This is what we set out to do, but there was a catch. To edit video one must actually know how to use the relevant software – admittedly, another skill I, at the time, knew embarrassingly little about. Fortunately I had two things going my way, 1) a relatively intimate relationship with Photoshop and a background of having been involved in electronic music producing, and 2) a friend and a team member, Raffe, who already knew many of the tricks of video editing. Thus I picked the same software (Premiere) and pleaded him at his doorstep long enough to soften his heart. Finally letting me in, he discovered his mistake. When it comes to software, I’m of the trial-and-error type, that is, trying and erring at a considerably fast and sloppy pace. You probably guessed it, he was of the more organized type. Yet, he managed to ram the fundamentals into my head with admirable grace (though I think the reason why he went to the restroom so often was, rather than relieve himself, to swear at my incompetence while muffling his voice with a towel). Our videography crew was now definitely in business. I remember that self-learning Photoshop at quite a young age was a tedious and frustrating exercise. It seemed that there was an excess of unfathomable things that ‘you were just supposed to know’. Oh, how the memory of these days of yore returned when I strarted to dig deeper into editing with Premiere. The basic editing tools themselves were quite straightforward, it was the bottomless abyss of video formats that got me. Never before have I read through so many user forums (and called Raffe when all else failed) and help files. Somehow however, we started to have a rudimentary skeleton of a piecemeal of a frame of a videography. We were on our way. And on that way we certainly did collide with the ACR 2009 Film submission deadline with quite a momentum. The ACR 2009 Pittsburgh had been our ultimate aim. To get a film accepted there was the goal, and this goal we had to achieve. What we did not anticipate, however, was how poorly we were prepared to finalize our material into something that could bear, even in passing, a resemblance to real videography. With multiple problems encountered with adding graphics, choosing acceptable target formats, and even fighting with the ‘credits’ tool, recording and mixing in a commentary seemed easy enough. And indeed, after two uncooperative audio interfaces and one broken laptop, we finally managed to squeeze my shaky voice on the film (at this point it was 5:30 in the morning, after all). The outcome was still clunky and quite unfinished (and today I certainly wonder if anything will ever really be anything else), but after two work-oriented nights, the deadline was upon us. We actually had to finally ship the finished submission DVDs in double-triple express mode (or alternatively the post office just decided to play a joke on us, you decide). Feeling a little dazed and incomplete (perhaps somewhat nauseous too – well I had been up for close to 48 hours), it was done however, and we felt comforted by the opportunity to rework some of the film if an ‘accepted’ with revision’ were to be upon us. And that was what we came to receive. The comments were brief, pretty much only suggesting us to shorten the overall length of the video. This was hardly surprising, as the original DVD we shipped out was a massive hour+ long. The final version came out to be a somewhat more manageable 47 minutes (still quite a mouthful). 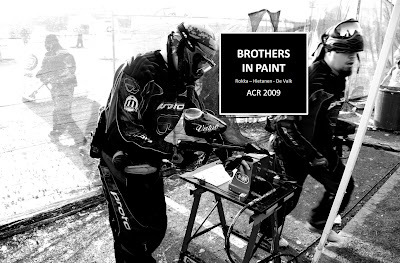 Yet, for us, it seemed difficult to cut parts away, as our study was intended to be a descriptive visual account of the social practices of tournament paintball culture. Ethnographic description (as anyone familiar with CCT ethnographies in JCR knows) needs substantial amounts of material to show as much as possible of the cultural practice, and we simply felt that every piece sliced off decreased the descriptive power of our argument. Anyhow, then we were off to Pittsburg to present our video at ACR 2009.